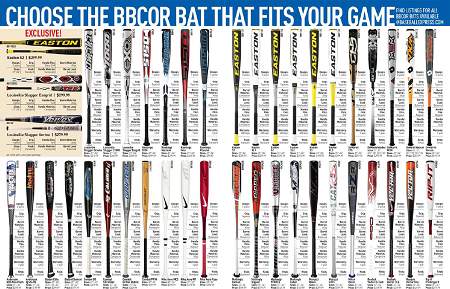 STATS DAD: Youth Baseball: BBCOR Bats for Christmas? 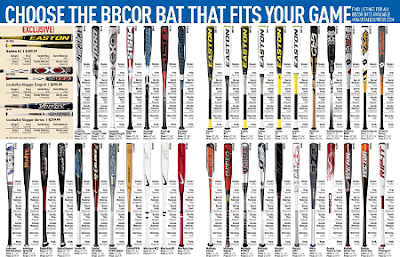 Youth Baseball: BBCOR Bats for Christmas? My son wants a new BBCOR bat for this fall ball season and for next spring. I told him we are going to wait until our league officially announces the BBCOR bat mandate. Before you buy - read this post and check out the BBCOR comparison app by baseball express. Here is a well written email from my son's baseball coach to the team regarding BBCOR bats and the lower expectations in terms of batting statistics associated with them. At the league meeting on Saturday, we’ll be discussing the BBCOR bat issue. I am not 100% certain at this point what the league is going to do, but wanted to give you a heads up on the issue. The new BBCOR standard measures bat performance and replaces the previous BESR (Ball Exit Speed Ratio) standard. The NCAA required BBCOR baseball bats for the 2011 season. For NFHS (National Federation of High Schools), all bats must be BBCOR certified for the 2012 season. 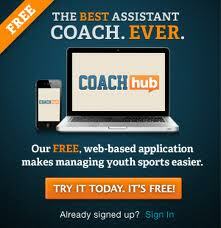 I expect the league to follow the NFHS for 13U and up at a minimum. BBCOR stands for Batted Ball Coefficient of Restitution (What?). Simply put, it’s a measurement of the LOSS of energy for both the ball and the bat at impact. Instead of measuring the speed of the ball after it is batted (BESR and the current standard), BBCOR measures the “trampoline” effect on BOTH the ball and the bat. A PITCHED ball holds a lot of energy, with wood bats much of that energy is lost as the ball compresses on impact with a dense surface. With hollow-core aluminum or composite bats (most of our current bats) the thin walls flex which distorts the ball less therefore the ball retains more of its original PITCHED energy plus gains the power of the bat’s speed and the bat’s flexibility. The less energy lost from the pitched ball, the faster the BATTED will be launched off the bat - therefore non-wood bats hit balls FASTER than wood bats. Why not just go to wood? Money. The expense would increase annual operating costs significantly – especially for a 24+ man high school or 35 man NCAA rosters. The bottom line – new bats under the Christmas tree will have to carry the BBCOR stamp on the bat and may be inspected by umps this year. Division I batting average, scoring and home runs per game in 2011 resemble the wood-bat 1970 era. Division I teams in 2011 averaged 5.58 runs per game, well off the record 7.12 in 1998. Batting average in 2011 was .282, the lowest since 1976. Note - earned-run average, on the other hand, was its best (4.70) since 1980 (4.59). The new bats will be much safer. And I believe that the games will be more enjoyable (See post about a great wood bat tournament). The 20-19 three hour games will be replaced with 3-2 nail biters. Pitching, bunting and fielding will become much more important. Baseball will be baseball again and I welcome the change. This is good news for the sport and safety. Repeated slugfests get old quickly. Agreed. It is not good for my wallet. My son is U14 - this spring he will need a drop 5 bat. (32 inches and 27 oz) Kind of heavy compared to the bats he has used in the past. HS require drop 3. (32 oz 29 oz). It is too big a jump to go drop 3 this coming year so I will be buying a drop 5 this year and a drop 5 next. These bats are not cheap. It's amazing the science that goes into making sports equipment these days. Youth Soccer: Hope Solo Jr.?